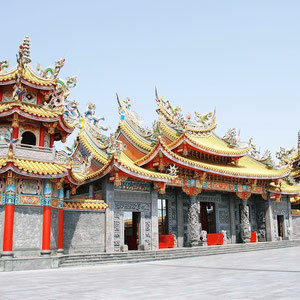 Sheng Tian Gong, directly translated as the "Holy Celestial Palace" is a Chinese/Taiwanese Taoist Temple. 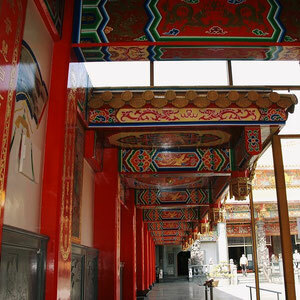 Taoism along with Buddhism and Confucianism, is one the three great religions of China. 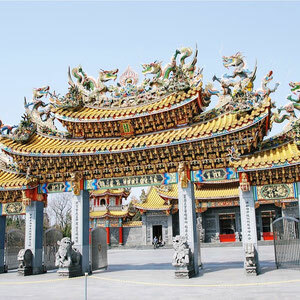 Unlike Japanese Buddhist temples which are oriented mostly for the afterlife and for worshipping of ancestors, Taoist temples are for worshipping of gods and people pray for the protection and improvement of their present life. 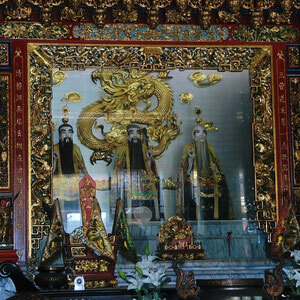 Enshrined in Sheng Tian Gong are the “San Chin Tao Tzu”, meaning “the three pure origins of the Tao” (Yuan-shin-tian-zun, De-tao-tian-zun. 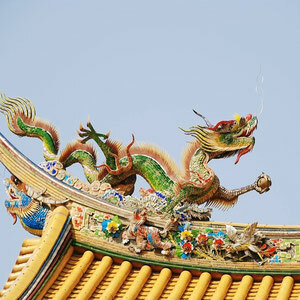 and Ling-bao-tian-zun) along with multitudes of other Taoist deities. 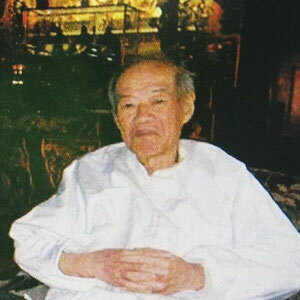 The funder of Sheng Tian Gong is a Taoist priest, Kang Kuo-Den. He was stricken by an incurable illness in his early forties and found his salvation with San Chin Tao Tzu. 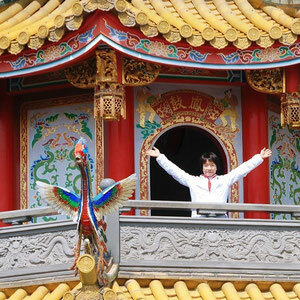 After seven years of hospitalization he was cured, and decided to build a temple as a gesture of gratitude for recovery from the illness. 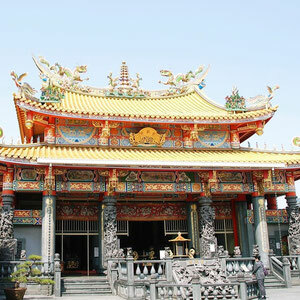 He also wanted to build a palace of worship for all and give everyone access to San Shin Tao Tzu’s salvation and protection. 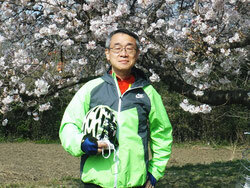 When searching for a site of construction, a revelation was granted to him to build it hear in Sakado. The name and the form of the “Holy Celestial Palace” were also revealed to him. Construction commenced in the spring of 1981 and after a total of 15 years, in autumn of 1995 it was opened to the public. 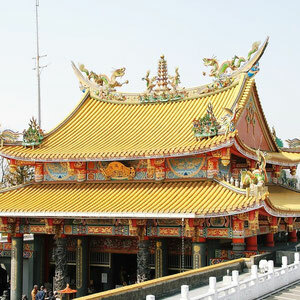 Shen Tian Gong is known to be one of the biggest Chinese/Taiwanese Taoist temples in Japan. 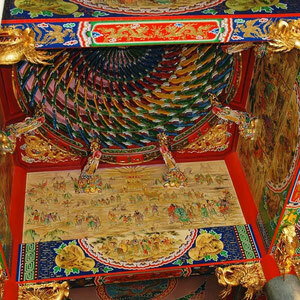 Its lavish decorations reflect the way Chinese view the celestial world. 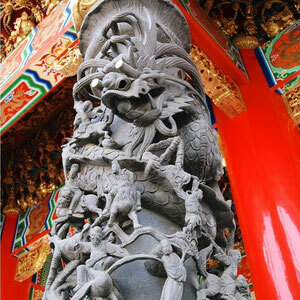 All carving, decorations and designs were conceived by Taiwanese artisans. 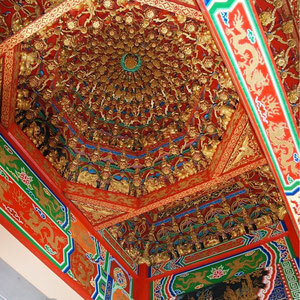 Elaborate ceiling decorations, 5-meter-high dragon pillars and 4-meter high camphor wood carvings on portable are all Taiwan.